MiB Community Blog: Are You Ready for the Holidays? And in the spirit of the Season, we have a FREE Gift just for YOU! If you spend $150 or more from now until 11:59 pm PST on Dec. 18, 2009, you will be able to pick one FREE Gift. 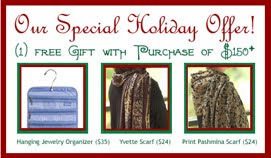 Choose from either a handy-dandy Hanging Jewelry Organizer (value $35), our unique Yvette Scarf ($24 value), or our luxe Print Pashmina Scarf ($24 value). To receive your discount once you've reached the $150+ amount in your shopping cart, enter the promo code: GIFT9W or mention this code if ordering by phone. Not only will enjoy receiving one of these gifts, they make great Holiday Gifts as well. Something to think about this time of year. Click HERE for details. 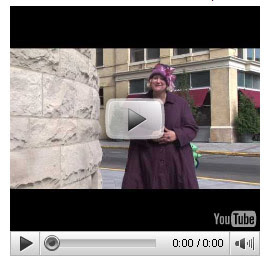 First of all, we are very proud to have some of our most popular MiB Coats featured on Kim Brittingham's newest Plus Size Clothing Review Video, "Coat Tales"! Kim is a popular author and essayist who has gained media attention for her humor-filled essays on what's it's like to be a Plus Size woman in today's world. She appeared on the Today Show because she did a social experiment in her hometown by getting on buses and reading a book with a fake book cover that gave the title as "Fat is Contagious". The results of her experiment were not only interesting, but humorous as well! This time around Kim is reviewing Plus Size Coats offered by various companies, explaining the reasons she likes them and what she looks for in such an expensive clothing investment. Kim reviewed 4 of our most popular MiB Coats & Jackets: Twill Swing Coat (in mesa), Tweed Wool Coat (in black & white tweed), A-Line Wool Coat (in red) and our Perfect Quilted Jacket (in planetarium). Do you run into gift buying quandaries each year about this time? Are you stumped on what to buy for your favorite plus size friends, coworkers and relatives? Are you trying to "stay-on-budget" this year? Are you looking for something with that extra special something? Don't despair! 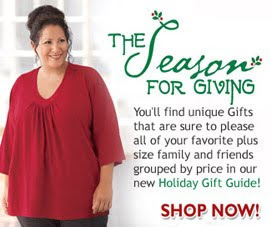 We've got you covered in the Plus Size Gift department. We just launched our new 2009 Holiday Gift Guide that's loaded with helpful gift suggestions grouped by price point ($30 or less, $50 or less, $75 or less and $150 or less) so not only will you be able to give a gift that you'll be proud to give, you won't ruin your Holiday Gift Budget! Can you keep a secret? Well IF you can, then I guess we can tell you about a special up-coming Holiday Shopping Event! Beginning on December 1st, we will be launching our new "Twelve Days of Christmas" promotion for email newsletter subscribers, which will feature a new One-Day-Only Discount on a special giftable item each day for 12 days. Great for gift-giving as well as self-giving! 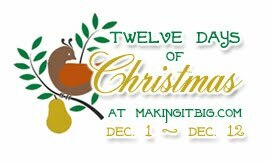 If you'd like to receive our special "Twelve Days of Christmas" One-Day-Only discount offers, you can sign up to begin receiving our MiB Newsletters right on the top left side of our MakingitBig.com website. Earn Money for Gifts by Promoting MiB on your Website! Do you need some extra money for buying gifts this year? Do you have your own website or blog? Yes, you say! Well then, we have a great way for you to do just that...join our new MiB Affiliate Program and begin earning 6% commission. You can learn more about our new Affiliate Program by clicking HERE. 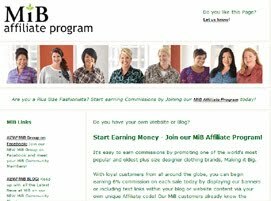 We launched our new MiB Affiliate Program via Google Affiliate Networks just a few months ago and already our affiliates are earning well-deserved commissions! In fact our clicks convert to actual sales at a dependable rate and even out perform the conversion rates of many other apparel merchants in the Google Affiliate Network! This may be because Making it Big has been in the Plus Size Apparel business for over 25+ years, we ship our products worldwide, we use actual plus size models in our catalogs, we design & size our clothing specifically for the plus size woman's figure, we give back to our community, we are a green/sustainable business and we have a loyal following of satisfied customers around the globe. Whatever the reason, our affiliate partners are doing very well with our product line and we are extremely pleased with our recent sales and the new customers we have acquired via our new network of affiliates! To learn more about our MiB Affiliate Program click HERE. We hope to welcome you as a new MiB Affiliate soon! For over 25+ years MiB has been devoted to the fashion needs of Plus Size Women. We design our clothing to fit perfectly and give you the fashion-forward look you desire. Our new MiB Community Blog is your place to connect and to find out about all of our MiB Events & New MiB Styles. Enjoy!